Councillor Christopher Wellbelove, the extremely active Mayor of Lambeth braved the recent fowl weather to wing his way toward the newly opened 'Chicken Cottage' on Clapham Road, near Stockwell tube station. It certainly wasn't a poultry turn out with managers, staff and customers posing for a photo outside the new take away, which has created five new jobs (hopefully the pay is not chicken feed). While the Mayor opted for a veggie burger, locals tucked into some finger-lickin food. 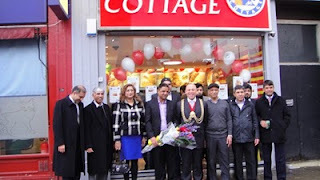 The Mayor said, "I was welcomed by Syed from the Sun Star Group, which runs several businesses in Lambeth including the Costcutter around the corner, and he was clearly delighted by the new store."